Men's Alternative Wedding Ring : LOVE2HAVE in the UK! 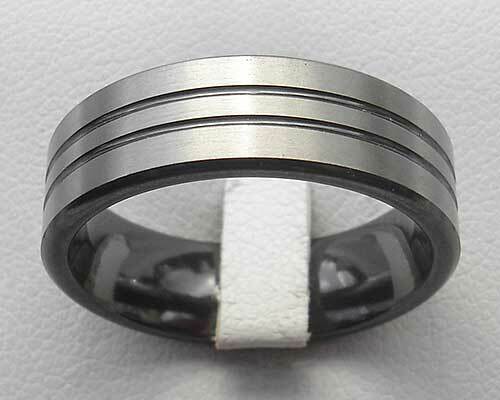 A 7mm wide flat profile zirconium men's wedding ring with a relieved (natural) coloured zirconium outer surface that also comprises of a twin grooved design in black. This ingenious but subtle design comes created by machine skimming away the surface of heat treated zirconium. The natural colour contrasts with the dark indented grooves and has an attractive velvety appearance. This ring with its lush surfacing makes a very stylish alternative wedding ring for both men and women. The version pictured here is in a satin finish which we think looks great and would make a cheaper alternative to a traditional wedding ring.